Looking at the future of electric vehicles, Edward Jobson could see it was time to make a career adjustment. Back in May he was running global electric bus research development for Volvo Trucks. It was a good gig. The business is starting to take off as Europe and other regions work to reduce noise and pollution in major cities. But in June, Jobson became the company’s vice president for electromobility, diving into its plans to roll out a line of electric trucks. What Jobson learned in the bus business convinced him that electric trucks represent the future of freight and logistics. 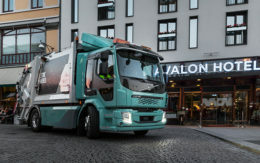 “The time has come for electric trucks,” Jobson told Trucks.com at a recent demonstration of Volvo’s prototype electric truck in Gothenburg, Sweden. Jobson talked to Trucks.com about the link between electric bus and truck development, and where the industry is headed. Here is an edited version of that conversation. Will electric trucks and buses be more or less reliable than diesel vehicles? They are more reliable when it comes to up time. You have a service and maintenance scheme with diesels that interrupts their operation. It’s less intense with electric. You need to change the tires and do some things like changing oil in the compressor, but the service is not as frequent, and it is less work. What has the adoption of electric buses told you to expect about the adoption of electric trucks? It means we have all the miles and the experience of the platform. The electric hydraulic system, the electric drive, the power electronics, the electric machine are all the same. We are using similar solutions. We have adapted that knowledge when we did the PTO for the trucks. We have learned a lot from the bus side. How far behind buses is electric truck adoption in the commercial world? It’s like what a Nobel Prize winner once said: “It took me 20 years to get the Nobel Prize, to do all this new thinking, but when I get new students it takes them two months to learn what took me all that time.” It’s the same thing. What is the greatest obstacle to electric truck adoption? That’s a very tricky question. When does a customer want to step in because the development is so fast on the battery side, on how we build the trucks. You need to decide: do I want to be an early adopter, probably paying a higher price, or do I want to wait another couple of years and get a lower price and better technology? That is a complication that is bothering many customers. When should I step in? Do you see the U.S. behind Europe in interest in electric trucks? It isn’t technology-wise. The problem in the U.S. is the fuel price. Development and adoption is strongly driven by how much that you can actually lower the operational costs. We have roughly the same electricity prices in the U.S. and Europe, but the fuel price is much lower in the U.S. So, the fact that you can operate your diesel truck to a lower cost than in Europe is a hurdle. Volvo’s electric trucks are for local use, when will they work for long haul? If you don’t have any adaptation of your behavior, if you don’t accept charging while you are taking a rest break or if you really want to fill it up with electricity in the same way as you fill up diesel, it is a long time to go. 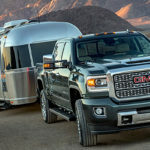 If you can adapt your behavior to resting times, if you can get charging stations where the trucks are actually situated, you don’t need to wait more than another four or five years. It’s roughly that time range. It’s not 10 years. With electric bus adoption ahead of electric trucks, where does Volvo stand? We have about 100 electric buses in service. We are selling a lot. It’s really ramping up. We had two versions. One is fast charging only, [with a high voltage roof-based connection.] And we have the version that can do both fast charging and overnight slow charging. The new version has much more batteries on board. Will electric buses replace diesels, and in what time frame? Electric buses are replacing diesels now. Many places are talking about policies to replace diesel with electric buses. It’s happening everywhere in China and in Europe. That’s because it’s environmentally friendly. You have less pollution, you have less noise, less stress of the driving, and the working environment is much better. Congratulations to Edward! Volvo has a huge leg up on its competitors due to their pioneering work on electric buses, including the overhead fast charging system “OppCharge” (see oppcharge.org). This automatic charging system will be essential for very high power charging for trucks – in fact, autonomous electric trucks will obviously require an automonous charging system, and OppCharge is already highly developed, standardized, and in daily service worldwide.